It's almost time to say Good Bye to the autumn and what would be the better Good Bye than to celebrate the Autumn Lore! Join us on this Festival in Bitterwind Plains (Lilyut Hills). * During this period of time the area will be under Festival Law, which means you will be unable to attack players of opposing factions. Festival Manager Emily will help you to start your acquaintance with the new world, you will find her in Bitterwind Plains. Complete quests and be rewarded with Harvest Festival Coins You'll be able to exchange them in our Festival Exchanger or in Mirage Isle Exchanger to pets, decor, chests and other interesting things. Note! During this festival you'll be able to craft "Hermit's Footprints" (Boots piece from Hermit's Costume). On the picture is a full Hermit's costume. From this event you can obtain Boots only - Hermit's Footprints. Other pieces of the costume will be available in future events. The most active will have a chance to receive a title - Storyteller. Title Increases Printing Proficiency +10000, Handicrafts Proficiency +10000, Artistry Proficiency +10000. 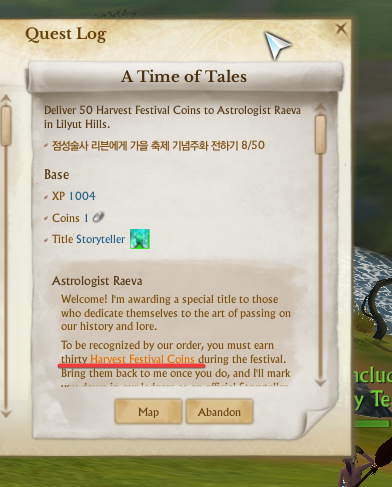 For it complete quest "A Time of Tales" and earn 50 Harvest Festival Coins during the festival. Important! There are also hidden Achievements present, that you may be interested in. - Complete the quest "Beginning of the Festival" 5 times. - Complete the quest "The Story Jar" 30 times. Zenais, Lena_Love, dzhafarmakhmudov and 2 others like this. Lusk, Sophie and Gen like this. Does this event run twice a day? If not how can we complete the quest "The Story Jar" 30 times? how does this work? the achievement requires 2/2, but the description says complete either one or the other..
so uh how do we finish this achievement if we can only finish one quest? Correct amount is 50. We'll correct the info in the text not to confuse players. Thank you! Is there any portal in East to there? There will be a worldgate in Austera, in the hero hall. If i recall correctly, i think the rum runner one didn't show up until you got it. Like, a hidden one that showed when you found him 5 times and got the lute at 7 times. I could be wrong tho. I just figured since he was at this event too that there would be one unless it's just a 1 time achievement. I could be mistaken. Just figured i'd ask to be sure. Spent all day yesterday clicking on him and nothing so wasn't sure. I was wondering this earlier too. Have gone back and forth and it won't give me a quest in Rookborne and Lilyut doesn't have another one for me. norhi and Roxiee like this. @Aumdaydar @Lusk Will check the possibility to turn it into the one players can wear and add it as a separate costume. Lusk, xkf2, Aviendha and 2 others like this. If I didn't get the other parts of the Hermit's Hill costume, will they repeat in other festivals? Will we get a chance to complete the costume even if we missed the previous parts? To know if I should waste my coins on it or not.